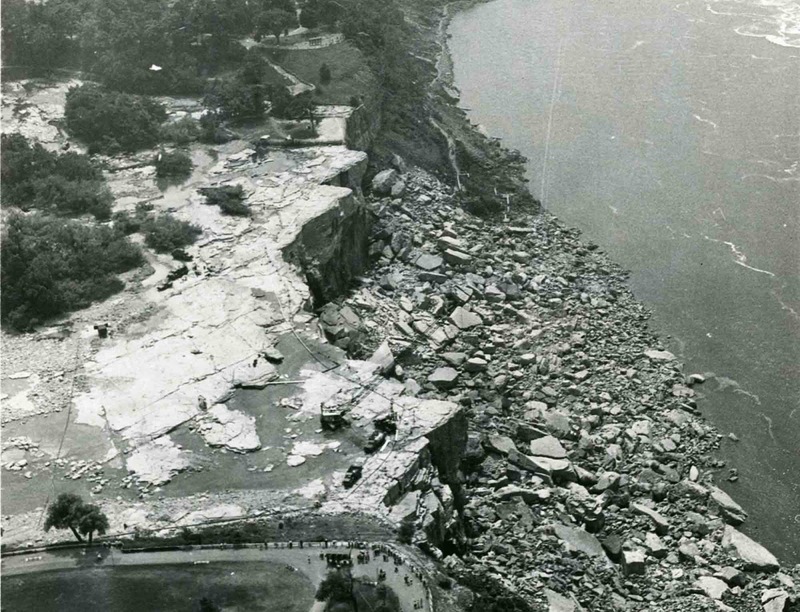 In June 1969, U.S. engineers diverted the flow of the Niagara River away from the American side of the falls for several months. The temporary dam can be seen in the top-right of this photograph. 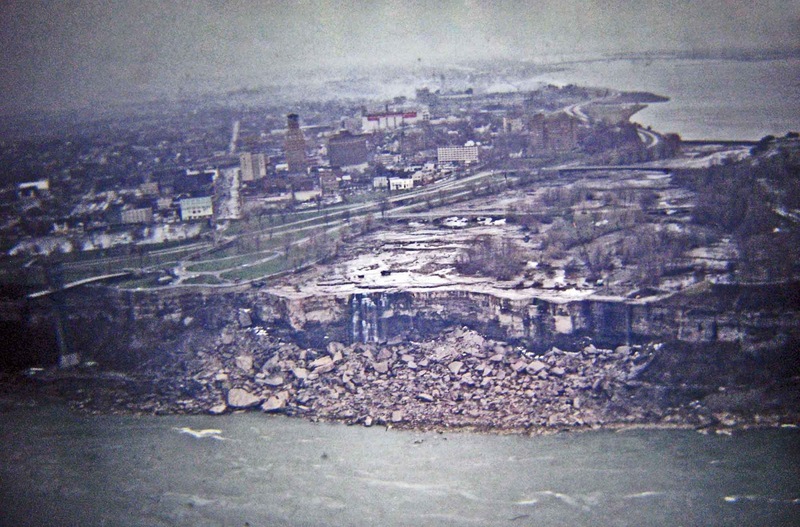 For six months in the summer and fall of 1969, Niagara’s American Falls were “de-watered”, as the Army Corps of Engineers conducted a geological survey of the falls’ rock face, concerned that it was becoming destabilized by erosion. These stark images reveal North America’s iconic – and most powerful – waterfall to be almost as dry as a desert. Niagara Falls is the collective name for three waterfalls that straddle the international border between Canada and the United States. From largest to smallest, the three waterfalls are the Horseshoe Falls, the American Falls and the Bridal Veil Falls. The Horseshoe Falls lie mostly on the Canadian side and the American Falls entirely on the American side, separated by Goat Island. The smaller Bridal Veil Falls are also on the American side, separated from the other waterfalls by Luna Island. The riverbed was crisscrossed with a series of cracks that were being examined for possible links to rockslides. While the Horseshoe Falls absorbed the extra flow, the U.S. Army Corps of Engineers studied the riverbed and mechanically bolted and strengthened any faults they found. 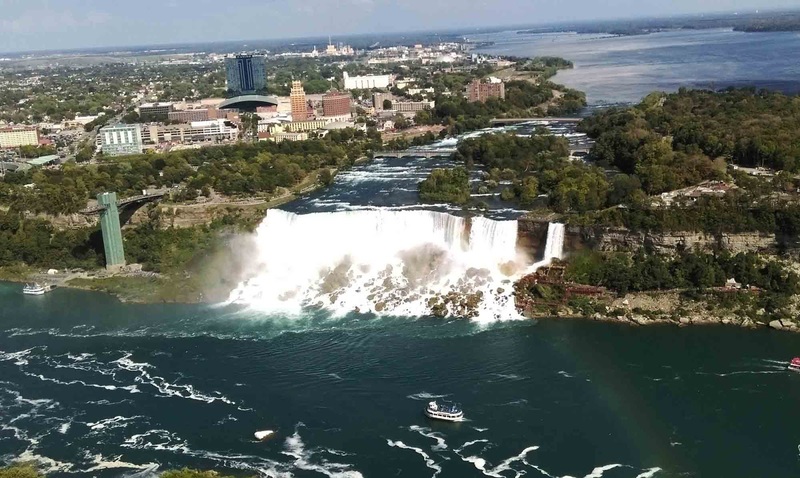 To dewater the Niagara’s American Falls the army had to build a 600ft (182 m) dam across the Niagara River, which meant that 60,000 gallons of water that flowed every second was diverted over the larger Horseshoe Falls which flow entirely on the Canadian side of the border. The dam itself consisted of 27,800 tons of rock, and on June 12, 1969, after flowing continuously for over 12,000 years, the American Falls stopped. The completed dewatering of the American Falls was made easier because only 10% of the water follows that route. 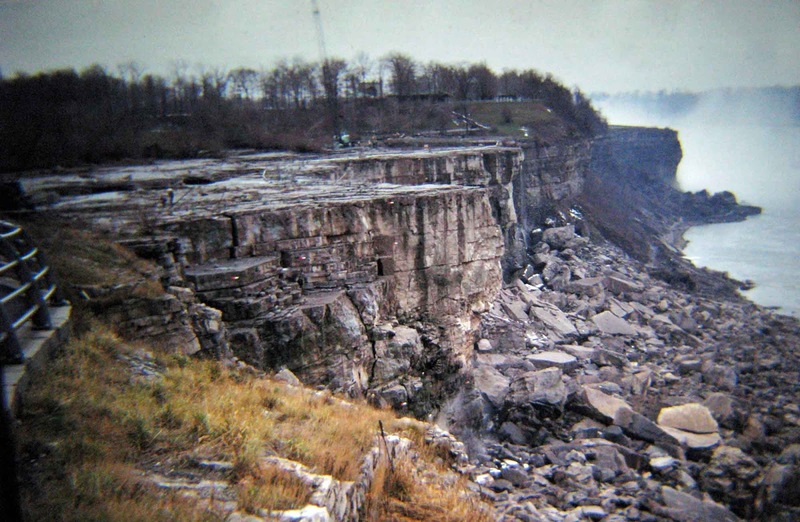 While the Horseshoe Falls absorbed the extra flow, the U.S. Army Corps of Engineers studied the riverbed and mechanically bolted and strengthened any faults they found; faults that would, if left untreated, have hastened the retreat of the American Falls. A plan to remove the huge mound of talus deposited in 1954 was abandoned because of the high cost. For a portion of that period, while workers cleaned the former river-bottom of unwanted mosses and drilled test-cores in search of instabilities, a temporary walkway was installed a mere twenty feet from the edge of the dry falls, and tourists were able to explore this otherwise inaccessible and hostile landscape. During this time, two bodies were removed from under the falls, including a man who had been seen jumping over the falls, and the body of a woman, which was discovered once the falls dried. Finally, in November 1969 in front of 2,650 onlookers, the temporary dam was dynamited, restoring flow to the American Falls. 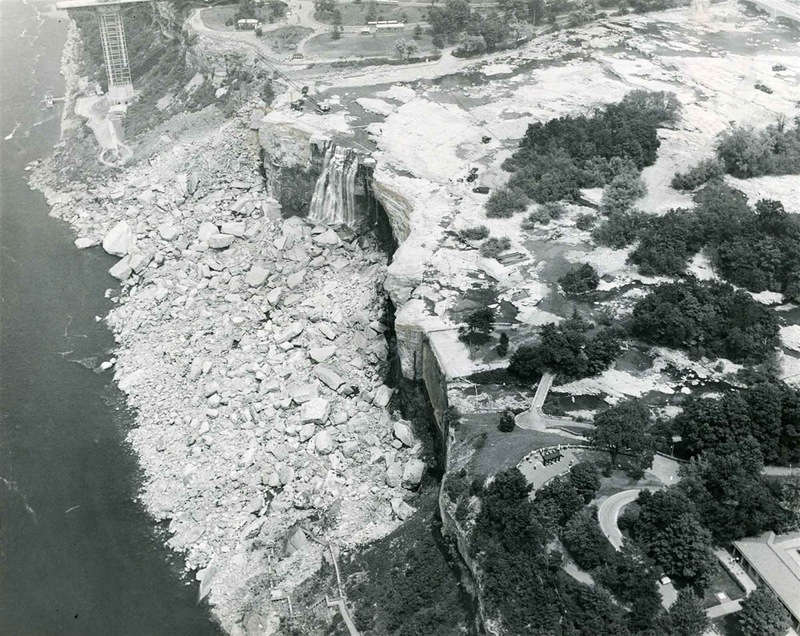 Even after these undertakings, Luna Island, the small piece of land between the main waterfall and the Bridal Veil, remained off-limits to the public for years owing to fears that it was unstable and could collapse into the gorge. The Niagara’s American Falls. (Picture taken in 2016). 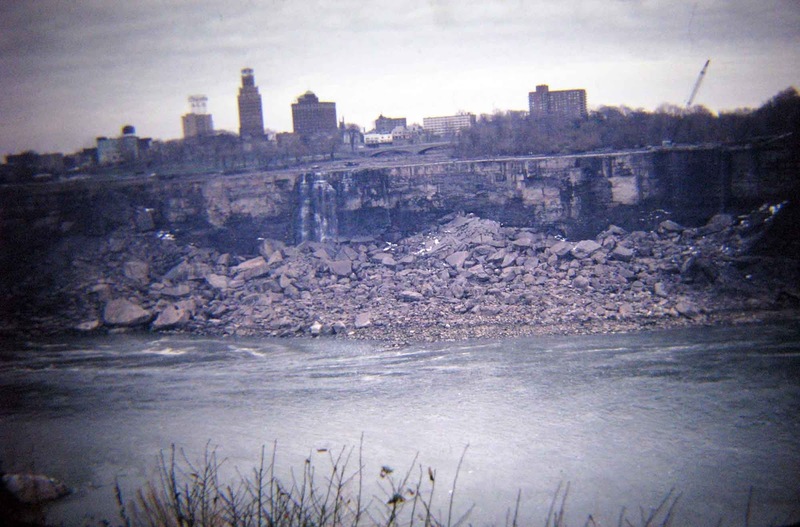 Today, erosion of the American Falls is estimated at 3 – 4 inches every 10 years (used to be on average 4 feet a year). The water flow which is regulated at a minimum level of 10% of the estimated 100,000 cubic feet per second during the summer (50,000 cubic feet per second during winter) is insufficient to cause major erosion. The formulation of the first paragraph misleads into believing that the U.S. part of the falls - the only one having been "revealed" and being shown here - is the most iconic and most powerful waterfall in N. America (both qualifications referring, of course, to the Canadian part of the falls). At first it says "The Horseshoe Falls lie mostly on the Canadian side" but then goes on to say "larger Horseshoe Falls which flow entirely on the Canadian side of the border"
I recall reading that in the 1840s an iceberg blocked the river feeding the falls. The subsequent silence woke the surrounding population who couldn't understand at first why they were so startled. I viewed this on Google Earth. If they drew the border on that correctly, the international boundry is slightly west of Goat Island, so a tiny portion of Horseshoe Falls is within the U.S.. Comparison to other features in the photos, like the roads and buildings indicates perhaps one or two hundred feet belong to the U.S., You can also view this with Google Maps using Satellite view. I remember the summer and fall of 1969 as a brilliant scientific 7 year old from Chippawa Ont. You can feel and hear the Thunder coming from the Falls every night through to the morning. The basic noise pollution of cars planes and motorcycles filled the air with the smell of gas and exhausts. Niagara Falls the 'great horseshoe' was alive and fierce during the day the mist had a pattern that danced on us all. The mist like the Falls was very much alive not so much as à mist was more like a torrential rain. Where everyone had their windshield wipers on full cautiously driving thru the mist zone. The drive from Chippawa to Niagara Falls the city was always greeted by the mist, again it was no mist! Today you should not go to Niagara Falls with out a poncho like rain coat, it shall be lite and portable. Because of the changes of the mist you may not need the coat at the Falls but fewer <100 meters you will need it. At times I had trouble sleeping having to withstand the intimidating Loud thunder. Just like in Jurrasic Park you can see the shock waves created in your glass of water. I am not sure if the waves in the glass were from the seismic or the acoustics of Niagara. So much more.. But if you do come to Niagara remember to listen for the Thunder especially at night when it's quiet. Niagara will give you powers within you that may heal you or make you a stronger athlete if you meditate and allow the energy to fulfil your soul. It's an amazing show you have got to see, hear ,touch and taste the mist on your face on a hot sunny day. So what are you waiting for grab yours and enjoy!